Including music by various gospel composers as well as hymns and spirituals made famous by Mahalia Jackson, this is a joyous celebration of the life and music of the world's greatest gospel singer: a humble, deeply religious woman whose expressive, full throated voice carried her from a three room shanty in New Orleans to appearances before presidents and royalty. The joy and inspiration of her heartfelt songs provide a counterpoint to the urgent messages delivered by her friend, Martin Luther King. Standing at his side, Mahalia Jackson became the musical voice of the civil rights movement. 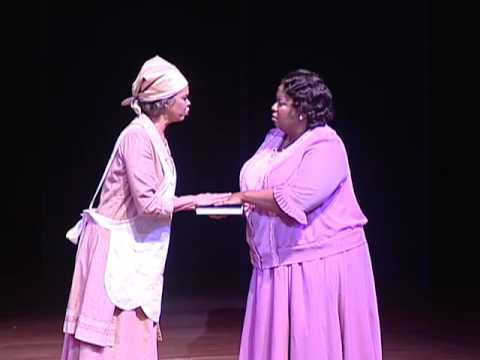 Mahalia uses simple staging, only three actors, and piano and organ accompaniments to showcase 22 great gospel numbers in a moving, often humorous musical tribute. This play is written for three actors. One actor plays Mahalia throughout. Another actor plays all the remaining female roles and must play piano, while the remaining actor plays all the male roles and must play piano and organ. All music and singing is performed live by the three actors. Mahalia was fi rst produced at the Old Log Theater in Excelsior, Minnesota on January 27, 1994.